The General Terms and Conditions of carpe event productions GmbH & Co. KG (carpe event productions) apply exclusively; conflicting conditions or such which deviate from these Terms and Conditions will not be accepted except where carpe event productions has expressly acknowledged their applicability in writing. The present Terms and Conditions apply equally where carpe event productions has unconditionally implemented the underlying contract in full despite having knowledge of conflicting conditions or such which deviate from the present Terms and Conditions. The present Terms and Conditions only apply to Unternehmer (entrepreneurs) within the meaning of Section 14 BGB (Buergerliches Gesetzbuch – German Civil Code), legal entities under public law and special funds governed by public law. They also apply to all future business relationships, even where they have not been agreed upon again explicitly. Offers of carpe event productions are – provided that nothing to the contrary has been agreed – non-binding. Where acceptance periods have been prescribed to the client in offer documents, respective offers become invalid upon the expiry of said acceptance periods without the requirement of carpe event productions having to serve a separate notice. Notices of acceptance which are being served late represent fresh offers of the client. Orders as well as any additions and amendments to orders require text form (Section 126 b BGB – does not require signature) in order to be valid. Deliveries will be made ex stock from Cologne. Upon the request and at the expense of the client, the delivery shall be sent to another place of destination. carpe event productions is entitled to determine the shipping modalities (shipping company, packaging, delivery method) in its free discretion. Delivery times and rental periods will be agreed individually or, as the case may be, will be specified by carpe event productions upon the acceptance of an order. Where compliance with agreed delivery times or rental periods becomes impossible for reasons for which carpe event productions is responsible or where carpe event productions is in default, the client shall have recourse to his statutory rights. A default, however, requires the prior service of a reminder in writing by the client, specifying a grace period. Any liability for claims for damages on the part of carpe event productions is subject to the restrictions set out in Section 7. Where nothing to the contrary has been agreed individually, the current prices of carpe event productions apply. All prices are net prices ex stock Cologne exclusive of packaging, which will be invoiced separately, and exclusive of the statutory VAT. Extra services or additional services requested by the client, such as a modification or upgrade of the material, will be invoiced separately in accordance with the current price list of carpe event productions. As regards possible further costs / charges that may arise in connection with the chosen method of payment, reference is made to Section 5.1 below. Invoices become due for payment within 10 days following the service of the invoice without deductions at the latest. carpe event productions is entitled to demand advance payments from new clients as well as in cases of particular advance performances (on the part of carpe event productions). Payments effected by cheque or by bills of exchange become valid payments upon their encashment. The acceptance of a bill of exchange always requires a prior written agreement with carpe event productions. Foreign cheques trigger a collection fee in the amount of €13. carpe event productions does not assume any liability for the timely production, protestation, notification and return of the bill of exchange in cases of non-encashment of the latter, provided that carpe event productions or Erfuellungsgehilfen (individuals employed to render contractually owed performances pursuant to Section 278 BGB) employed by carpe event productions do not act with intent or gross negligence. Charges / expenditures and interest which may accrue in the context of remittances / payments made from abroad shall be borne by the client. In the case of late payments, carpe event productions may invoice a flat rate service fee in the amount of €5 for each reminder served. Moreover, carpe event productions is entitled to its further statutory claims and rights. The client may claim set-off rights and rights of retention only insofar as his respective claims have become res judicata or are undisputed. carpe event productions retains the legal title to any rented material and accessories. In the case of a purchase, carpe event productions retains the legal title to the purchased item until the payment in full of all outstanding claims arising from the purchase contract and, as the case may be, from the existing business relationship. Where carpe event productions is the proprietor of the subject matter of the contract, the client is obliged to notify carpe event productions of any changes to the site of operation/location, of confiscations, seizures as well as of insolvency proceedings or out of court settlements of or over the assets of the client without delay. cancellation 1 day prior to the commencement of production (intended preparation day): 100% of the total value of the client’s order. The compensations specified above become due irrespective of whether the client is or is not responsible for the reason for the cancellation. They do not accrue where carpe event productions is responsible for the cancellation and therefore for statutory reasons such cancellation does not entail any claims for damages or compensation; in such cases any claims of the parties may arise from the applicable statutory provisions only. In relation to the liquidated damages set out above, carpe event productions reserves the right to evidence that it has suffered a higher amount of damage and loss and the client may evidence that no or substantially less damage and loss has been suffered. Insofar as it corresponds with the scope of the order, carpe event productions is also responsible for the orderly delivery or collection and/or for the required installation, including the assembly and disassembly, of the rented subject matter, otherwise merely for the handover of the rented item ex stock carpe event productions. Where the rented item is discernibly defective already upon the conclusion of the contract, the client may invoke such only if the notice of defect is included in writing in the acceptance certificate. Where a defect shows during the rental period, the client must notify carpe event productions of such in writing without delay and must include a precise (and insofar as possible photographically evidenced) description of the defect. Where the client omits to serve the notice of defect, he shall be liable to pay compensation for any damage and loss that may arise from such. The client may only raise claims pursuant to Sections 536, 536a BGB for rent reduction or for damages or for reimbursement of expenses where carpe event productions proved to be unable to remedy the limited fitness for purpose or lack of fitness for purpose of the subject matter of the contract following the receipt of a respective written notice of the client within a reasonable period of time by way of repair / specific performance or delivery of a replacement. The right to claim damages is further subject to the restrictions set out in Section 7. Any sub rental of the subject matter of the contract requires the prior written consent of carpe event productions. The client is obliged to examine any goods delivered immediately (until the second business day following the date of delivery at the latest) following their delivery and to notify carpe event productions in writing of any discernible defects, subject to a precise (and insofar as possible photographically evidenced) description of the defect. Hidden defects shall be claimed in writing immediately after becoming known in accordance with the specifications set out above. Defects which are being claimed late, i.e. contrary to the obligations specified above, will not be taken into consideration and are excluded from the warranty. Where existing defects are suitable for causing further damage to the defective product and for endangering individuals or property, the client must immediately cease to use the item and must inform carpe event productions of such cessation of use. The resumption of use requires the prior consent of carpe event productions. The above shall not affect any existing examination obligations and supervisory duties of the client. In the case of a defect, in a first step, the client has the right to demand specific performance. carpe event productions decides in its free discretion whether it will deliver a new item or whether it will repair the defect. In the case of a failure, i.e. an impossibility, unreasonableness, refusal or unreasonable delay of the repair or the replacement, the client may rescind the contract or reasonably reduce the purchase price. Where carpe event productions proves to be responsible for a defect, the client may claim damages subject to the additional requirements specified in Section 7 below. The warranty period amounts to one year following delivery. This shall not apply in the case of a liability for loss of life, bodily injury or health impairments as well as in cases of intentional or grossly negligent breaches of duty of the supplier or his agent/subcontractor. In these cases, the statutory limitation periods apply. The client must in each case evidence that the defect was already in existence upon delivery. With the handover of the rented item to the client and/or his employees or other individuals authorised by him, the risk for the rented item passes to the client in whole. The client must ensure that the item rented by him is being stored, transported, used and maintained in accordance with the manufacturers’ requirements. The client guarantees that the item is being operated, installed and moved by qualified personnel in accordance with the requirements of the manufacturers and in particular that all safety standards are being observed. Further, the client must ensure the required insurance cover and must evidence the existence of the cover to carpe event productions upon request and from an order volume of €10,000 – onwards without the requirement of such request by way of production of a respective insurance policy. The policy must cover all possible dangers to the item of carpe event productions, such as theft, vandalism, fire and many more. could entail damage to the item provided by carpe event productions. A respective justified refusal of carpe event productions does not affect the payment obligations of the client. The client must ensure the required insurance cover for the item rented by him and must evidence the existence of the cover to carpe event productions upon request and from an order volume of €10,000 – onwards without the requirement of such request by way of production of a respective insurance policy. The policy must cover all possible dangers to the item of carpe event productions, such as theft, vandalism, fire and many more. In case of any damage or loss of the rental material, the damages are calculated in accordance with the replacement value of the goods in accordance to the current version of the price list. The liability for damages of carpe event productions, irrespective of its legal foundation, is, insofar as culpability is required, limited pursuant to this Section 7.
carpe event productions does not assume any liability for cases of merely negligent acts of its organs, statutory agents, employees or other agents/subcontractors where no breach of material contractual obligations is involved. An obligation is material to the contract where its fulfilment is a prerequisite for the orderly performance of the contract and whose fulfilment the client may normally rely on. Insofar as carpe event productions is in principle liable for damages pursuant to Section 7.2, such liability is limited to damage and loss which carpe event productions has foreseen as a possible consequence of a breach of contract upon entering into the contract or which it could have foreseen had it applied the standard of care customary in business. Indirect damage and loss and consequential loss which arises as a consequence of the defects of the item delivered will only be compensated if such damage and loss can typically be expected in the context of a proper use of the delivered item. The above limitations and restrictions of liability apply to the same extent for the benefit of the organs, statutory agents and employees of carpe event productions. All claims for damages brought against carpe event productions, irrespective of their legal foundation, expire within one year following the delivery of the goods to the client, and in the case of a liability in tort following the acquisition of knowledge or grossly negligent failure to acquire knowledge of the circumstances giving rise to the claim and of the identity of the party liable to pay compensation. The above shall go without prejudice to any liability for intent or gross negligence as well as for any liability arising from a guarantee, from a fraudulent non-disclosure of a defect, for loss of life, bodily injury or health impairments as well as for any liability pursuant to the Produkthaftungsgesetz. In these cases, the statutory limitation periods apply. 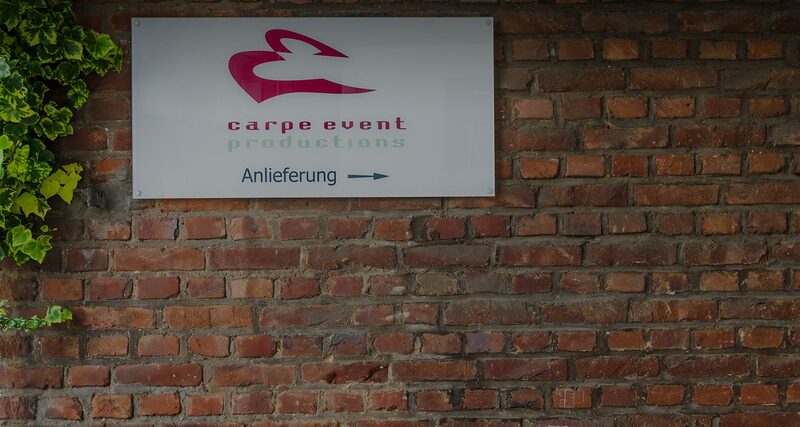 The exclusive place of jurisdiction for all disputes arising directly or indirectly from the contractual relationship shall be the registered office of carpe event productions in Cologne. The laws of the Federal Republic of Germany apply subject to the exclusion of the United Nations Convention on the International Sale of Goods (CiSG).